I've been checking on my little darlings at least a few times a day. I thought it was all in vain until last night I saw a glimmer of white sprout - and this morning there was quite the show! 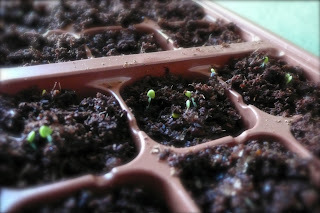 The basil turns out to be a little precocious, sprouting on day 3, no less. Still no sign of the parsley or the coriander - maybe they're feeling shy. Yesterday I took the plunge and planted the seeds I bought back in February. 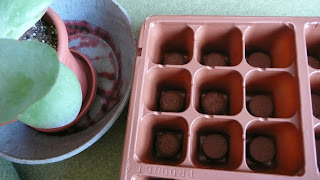 I'm using a planter that came with the soil included, in pellet form - perfect (I hope) for the urban gardener. Just add water. 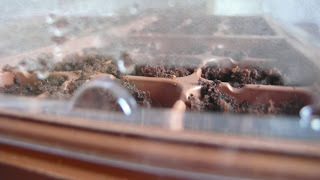 I've planted Italian parsley (seeds above), as well as coriander and basil, since they are my most frequently used herbs. My punishment for procrastinating is that there will be no homegrown cherry tomatoes to go with my basil. They would hardly be rosy, let alone a deep red, before I head back to London in August. 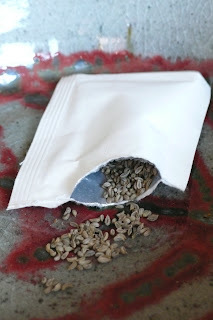 The packets said the seeds should germinate in 7-14 days, but I'm hoping that the little greenhouse they are in will help them sprout up a little faster. Stay tuned. This is too beautiful not to share. Check out the gorgeousness of KUIDAORE, a new favourite food blog of mine (that's new to me, not new to the world). Joycelyn writes mostly, though not exclusively, about baking and sweet things. Her writing is engaging, her photos are delectable and I imagine her food is both.